Heart Failure (HF) is the outcome of most cardiovascular conditions. It is a common complication of surgery that may present in patients with the chronic form of the disease, but it may present in asymptomatic patients with preserved ejection fraction and diastolic dysfunction. Even though HF is a clinical diagnosis, the echocardiogram, and natriuretic peptides allow the classification of Left Ventricle HF (LVHF) into three different categories; HF with reduced Ejection Fraction (HFrEF), ejection fraction <40%; HF with midrange EF (HFmrEF), EF 40%-49%; and HF with preserved EF, EF>50%. Right ventricle heart failure results from abnormal RV structure, function or both and presents with symptoms similar to those of LVHF. HF is a predictor of increased perioperative risk and is higher if the patient is decompensated, has a low EF or is symptomatic. Drugs to treat pre-existing heart failure, arrhythmias, hypertension, and ischemic heart diseases should continue during the perioperative period. Anesthesiologic management must ensure the proper maintenance of organ flow and perfusion pressure. Volatile anesthetic agents offer better cardio-protection than intravenous agents, and epidural anesthesia is preferable to spinal anesthesia. The presence of abnormal perioperative filling pressures supports the early use of inotropes instead of using additional fluids to control hemodynamic alterations and avoid pulmonary edema and vascular overload. This review presents critical elements for the proper perioperative management of heart failure. Heart Failure (HF) is the outcome of most cardiovascular conditions. It affects almost 26 million people and is responsible for $31 billion in health costs [1,2]. The prevalence of HF varies around the world, in Europe it goes from 1.36% in people aged 25-49 years to 16.14% in those older than 80 years ; in Asia is 1.3%-6.7%, and it had affected about 4 million people in China by the year 2014 . While in Latin America a metanalysis showed a prevalence of heart failure of 1% (95% confidence interval (95% CI), 0.1%-2.7%) , in the US 5.7 million people suffer from HF, increasing to 8 million by 2030 . Worldwide about 200 million patients undergo non-cardiac surgery every year, over 1 million dies within 30 days, and 20 million experience major adverse events [6,7]. Heart failure is a common cardiac complication of non-cardiac surgery, often occurring in patients with known chronic heart failure, but it may present in asymptomatic patients with preserved ejection fraction (pEF) and diastolic dysfunction. The incidence of primary cardiac complications after non-cardiac surgery is between 2% and 3.5% but rises to 20% in cardiac surgery . The 30-day postoperative mortality is 9.3% in nonischemic HF patients undergoing non-cardiac surgery and the hospitalization rate at one month is 15.5% . With the increasing prevalence of this condition and the aging population, more and more patients need surgery at any point during their illness and the correct assessment and management of this disease is mandatory. Are All Heart Failures Created Equal? HF is a clinical syndrome characterized by typical symptoms (e.g. breathlessness, ankle swelling, and fatigue) and signs (e.g. elevated jugular venous pressure, pulmonary crackles and peripheral edema) caused by a structural and/or functional cardiac abnormality, resulting in a reduced cardiac output and/or elevated intracardiac pressures at rest or during stress . The structural or functional abnormality may appear years before symptoms develop and become clear when extra stress affects heart function. The American College of Cardiology (ACC)/ American Heart Association (AHA) stages of HF classification recognizes four categories of disease progression . Stage A refers to patients at high risk of developing HF, stage B is structural heart disease but without signs or symptoms of HF, stage C denotes patients with structural heart disease with prior or current symptoms of HF, and, stage D describes patients with refractory HF requiring specialized interventions . Demonstration of an underlying cardiac cause is essential for the diagnosis and treatment of HF. Symptoms of heart failure may present in patients with reduced or preserved ejection fraction. The European Society of Cardiology (ESC) recommends a definition of HF based on ejection fraction (EF) . All patients presenting with symptoms ± signs of HF are categorized according to their EF as HF with preserved ejection fraction (HFpEF) for those with EF ≥ 50%, HF with midrange EF (HFmrEF) (EF 40%-49%) and HF with reduced EF (<40%) (HFrEF) . Patients with preserved and midrange EF must have elevated levels of natriuretic peptides (BNP >35 pg/mL and/or NT-proBNP >125 pg/mL) and, at least, one additional criterion, either relevant structural heart disease (left ventricular hypertrophy and/or left atrial enlargement) or diastolic dysfunction . In the acute setting, a higher value of natriuretic peptides is used (BNP >100 pg/mL, NT-proBNP >300 g/mL). The negative predictive values for natriuretic peptides are high in both, non-acute and acute settings (0.94-0.98), but the positive predictive values are low (0.44-0.57), so they are useful to rule out but not to confirm the diagnosis of HF . Natriuretic peptides may rise in cardiac conditions other than HF, such as acute coronary syndromes, heart muscle disease, atrial fibrillation, pericardial disease, cardioversion and; in noncardiac conditions, as in renal failure, advanced age, obstructive sleep apnea, bacterial sepsis and severe burns . 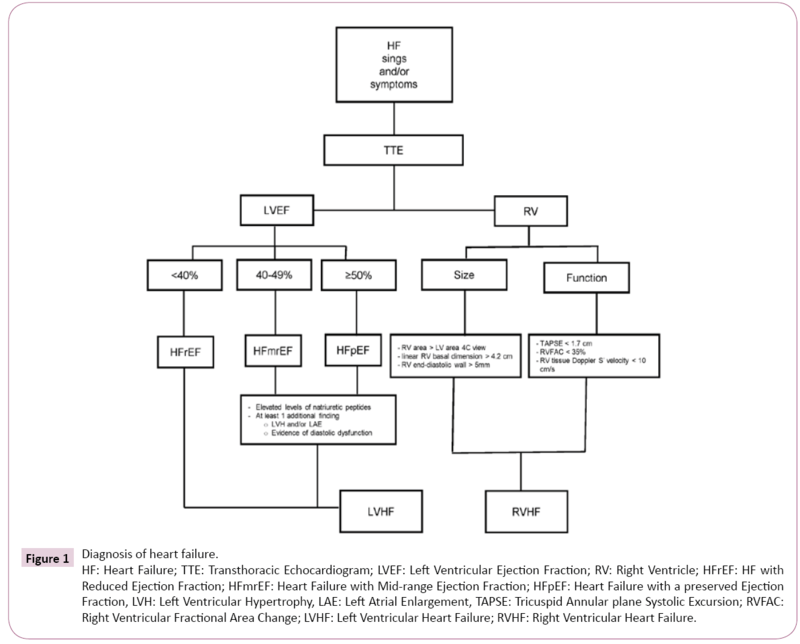 Figure 1 summarizes an integrated approach to the diagnosis of heart failure. Figure 1:Diagnosis of heart failure. HF: Heart Failure; TTE: Transthoracic Echocardiogram; LVEF: Left Ventricular Ejection Fraction; RV: Right Ventricle; HFrEF: HF with Reduced Ejection Fraction; HFmrEF: Heart Failure with Mid-range Ejection Fraction; HFpEF: Heart Failure with a preserved Ejection Fraction, LVH: Left Ventricular Hypertrophy, LAE: Left Atrial Enlargement, TAPSE: Tricuspid Annular plane Systolic Excursion; RVFAC: Right Ventricular Fractional Area Change; LVHF: Left Ventricular Heart Failure; RVHF: Right Ventricular Heart Failure. Right Ventricle Dysfunction (RVD) is the product of abnormal RV structure, function or both. RV Heart Failure (RVHF) is a clinical syndrome with signs and symptoms of HF resulting from RVD, and it is caused by the inability of the RV to support optimal circulation in the presence of adequate preload . The Right Ventricle (RV) morphology and structure are adapted to the physiological conditions in the pulmonary circulation, which are low resistance, high compliance, and low impedance. Therefore, it differs from the Left Ventricle (LV) with which connects functionally through the interventricular septum and the pericardium . The low RV afterload permits forward flow into the pulmonary circulation to occur in systole and early diastole. Coronary perfusion to the RV occurs in systole and diastole, compared to diastolic flow in the LV, making the RV dependent on systolic blood pressure . Chronic RVHF results from gradual increases in RV afterload caused by pulmonary hypertension most often from LV failure . The prevalence of RVD may reach 48% in patients with HFrEF and 33% in those with preserved ejection fraction . Peripheral edema is the most prominent clinical feature in chronic RVHF, but the patients may complain of exercise intolerance and fatigue and appear emaciated, tachypneic, and cyanotic. Clinical signs include increased jugular venous pressure, Kussmaul’s sign (increase in jugular venous pressure with inspiration), prominent v wave, palpable RV heave, tricuspid regurgitant murmur, a pulsatile liver, ascites, and other generic signs of reduced systemic hypotension. Hypoxemia and cyanosis may occur due to right-to-left intracardiac shunting in patients with patent foramen ovale [12,14]. Echocardiography is the primary tool to diagnose, categorize and follow patients with HF. It is noninvasive, non-expensive, widely available, and allows classifying changes in the heart of affected patients into structural and functional. Even though values may vary according to the source, structural alterations keys to diagnosing HF are a left atrial volume index (LAVI) >34 mL/m2 or a left ventricular mass index (LVMI) ≥115 g/m2 for men and ≥95 g/ m2 for women . The main functional alterations are an E/e’≥13 and a mean e’ septal and lateral wall <9 cm [10,15]. More recently the American Society of Echocardiography and the European Association of Cardiovascular Imaging (ASE/EACVI) published an update with recommendations for the evaluation of LV diastolic function by echocardiography . The four recommended variables and their abnormal cut off values in patients with normal EF are annular e’ velocity (septal e’<7 cm/sec, lateral e’<10 cm/sec), average E/e’ ratio >14, LA maximum volume index >34 mL/m2, and peak Tricuspid Regurgitation (TR) velocity >2.8 m/sec . Two or more of the characteristics above diagnoses diastolic dysfunction. Sometimes, only the lateral e’ or the septal e’ velocity is available, and a lateral E/e’ ratio >13 or septal E/e’>15 is abnormal . If the Transthoracic Echocardiogram (TTE) study reveals normal systolic and diastolic function but the clinical suspicion of HF is high, performing a diastolic stress test may explain HFpEF in patients who report exercise intolerance but do not have abnormal LVD function. Exercise is preferred over dobutamine stress testing and is positive for stress-induced diastolic dysfunction if all the three following measurements are present: average E/e' >14, peak tricuspid regurgitation velocity (TR) >2.8 m/sec, and septal e’ <7 cm/ sec. Increases of E/e’ >14 have a 90% sensitivity and 71% sensitivity for HFpEF and suggest that exercise diastolic stress testing may rule out HFpEF . In RVHF the echocardiographic evaluation includes measuring the RV size and quantitating its function. An RV area larger than LV area in end diastole in the apical 4-chamber view suggests RV enlargement. A linear RV basal dimension >4.2 cm also suggests RV enlargement. Tricuspid Annular Plane Systolic Excursion (TAPSE) is used to assess RV function (normal reference value ≥ 1.7 cm). The RV Fractional Area Change (RVFAC) <35% and the RV tissue Doppler S’ velocity <10 cm/s at the tricuspid annulus signal RV systolic dysfunction . RV diastolic dysfunction may be measured with tissue Doppler early diastolic myocardial velocity at the lateral tricuspid annulus (E) and early diastolic tricuspid inflow (E') ratio (E/E') as demonstrated in patients with pulmonary hypertension . Pathologic ventricular remodeling is responsible for the echocardiographic characteristics of HF. It includes alterations in heart dimensions, mass, and shape in response to molecular, biochemical, and mechanical changes. Remodeling involves all cells and components of the entire heart: cardiomyocytes, fibroblasts, endothelium, and the interstitium. The main macrostructural characteristics of cardiac remodeling are ventricular hypertrophy and dilation due to cardiomyocyte reorganization and elongation, increased ventricle wall tension, and impaired subendocardial perfusion . Several cellular changes, such as cardiomyocyte hypertrophy, myocytes apoptosis and necrosis, fibroblast proliferation, accumulation of proinflammatory mediators, and extracellular matrix reorganization with fibrosis induction, accompany cardiac remodeling. Many factors influence the progression of cardiac remodeling, including the severity of the causing event, possible secondary events, adaptive compensating mechanisms, adverse reactions, and the efficacy of treatment . The risk of perioperative mortality in patients with Chronic Heart Failure (CHF) is two-fold to four-fold higher compared with patients with isolated coronary artery disease. Patients with history/signs of heart failure undergoing non-cardiac surgery have an increased risk of death and Major Adverse Cardiac Events (MACEs) (relative risk 3.4). Other factors associated with preoperative MACE are a decreased Left Ventricular Ejection Fraction (LVEF) with the highest risk group being those with an LVEF <30% [19,20]. The Revised Cardiac Risk Index, derived from the assessment of 4315 patients aged 50 years or older undergoing elective major noncardiac surgery, demonstrated the importance of HF to predict complications . Heart failure is a predictor of increased perioperative risk. The risk is higher with decompensated versus compensated heart failure, systolic (reduced ejection fraction) versus diastolic (preserved ejection fraction) heart failure, and symptomatic versus asymptomatic heart failure [22,23]. In open vascular surgery both asymptomatic systolic and isolated diastolic LV dysfunctions were associated with 30-day cardiovascular events (odds ratios 2.3, 95% confidence interval [CI] 1.4-3.6 and 1.8, 95% CI 1.1-2.9, respectively) and long-term cardiovascular mortality (hazard ratios 4.6, 95% CI 2.4-8.5 and 3.0, 95% CI 1.5- 6.0, respectively) . In endovascular surgery, only symptomatic heart failure had 30-day cardiovascular events (odds ratio 1.8, 95% CI 1.1-2.9) and long-term cardiovascular mortality (hazard ratio 10.3, 95% CI 5.4-19.3) . HFrEF carries the worst prognosis in surgery irrespective of the procedure performed, and an EF<30 is an independent predictor for adverse perioperative events (OR 2.84, (95% CI 1.19-6.79) . Stabilization of ventricular function and treatment for pulmonary congestion before elective surgery should be a primary goal. Also, it is crucial to determine the etiology of the left heart failure because the perioperative monitoring and treatment are different . Even though echocardiography is of utmost importance to assess patients with HF, current evidence does not support its use in asymptomatic patients (grade of recommendation -weak, level of evidence low), but is useful in evaluating left ventricular function in patients scheduled for highrisk surgery (grade of recommendation +strong, level of evidence low) . The symptoms of angina and those of heart failure prompt further evaluation with echocardiography. Most anesthetic techniques reduce sympathetic tone, leading to a decrease in venous return due to increased compliance of the venous system, vasodilatation and, decreased blood pressure; thus, anesthesiologic management must ensure proper maintenance of organ flow and perfusion pressure . When vital functions are under control, the selection of the anesthetic agent is not a crucial decision. However, the guidelines suggest that using volatile anesthetic agents offer better cardioprotection than Intravenous (IV) agents in patients with cardiac disease undergoing cardiac surgery . Data on non-cardiac surgery are scarce . Most acute perioperative heart failure cases occur in patients who have decreased cardiovascular reserve before surgery. In the perioperative period, patients may face numerous triggers of acute heart failure, including hypertension, tachyarrhythmias, anemia, hypercoagulability, inappropriate fluid management, pain, surgical stress, and myocardial ischemia. Other possible causes of perioperative heart failure include acute or chronic valvular heart disease, pulmonary or fat emboli, which can present as an acute right ventricular failure . Anesthesiologists, Internists, and Cardiologists involved in the care of these patients must recognize potential complicating conditions to treat them before they can compromise the patients’ lives. HFpEF goes unnoticed because patients remain asymptomatic under normal life energy expenditure. However, when they reach the ward after an operation, they often end up in the Intensive Care Unit (ICU) with unstable vital signs in combination with pulmonary edema, which are not responsive to the normal use of Intravenous (IV) epinephrine or norepinephrine . The former leads to poor outcomes, caused by Left Ventricle (LV) Diastolic Dysfunction (DD) regardless of LV Systolic Dysfunction (SD), with hemodynamic instability developing due to surgery-induced adrenergic stimulation and anesthesia-induced sympathetic attenuation, resulting in a lengthy stay in the ICU or even death . A metanalysis showed a significant association of DD with pulmonary edema/congestive heart failure (odds ratio [OR], 3.90; 95% CI, 2.23 to 6.83; 996 patients), myocardial infarction (OR, 1.74; 95% CI, 1.14 to 2.67; 717 patients), and the composite outcome of major adverse cardiovascular events (OR, 2.03; 95% CI, 1.24 to 3.32; 1,814 patients), but did not show a relationship of 30-day or in-hospital mortality and DD, odds ratio with wide CI for DD (mixed grades) versus normal diastolic function (OR, 1.10; 95% CI, 0.62 to 1.94) . HFpEF was an independent risk factor of in-hospital mortality (hazard ratio=1.86; 95% Confidence Interval (CI), 1.16-2.98; P=0.01) and postoperative shock (adjusted odds ratio= 2.9; 95% CI, 1.5-3.0; P<0.001) in patients undergoing cardiothoracic surgery . Pathophysiological characteristics of HFpEF are a concentric remodeling or ventricular hypertrophy resulting in pressure overload, and backward heart failure  hence the typical symptoms of heart failure develop. The remodeled LV is stiff, and at any blood volume, it responds with a higher filling pressure. Diastolic dysfunction is related to chronic hypertension, ischemic heart disease or diabetes mellitus but can be associated with valvular heart disease, restrictive, infiltrative, or hypertrophic cardiomyopathies. DD can coexist with systolic dysfunction worsening the patient’s prognosis and management. Patients with HF symptoms should undergo a further clinical evaluation to determine risk factors associated with diastolic heart failure (Table 1) and echocardiographic assessment to test systolic and diastolic function. HFpEF patients are older, more hypertensive, obese, diabetic, and likely to have atrial fibrillation compared with patients with HFrEF . When the clinical and echocardiographic evaluations do not establish the diagnosis of heart failure, BNP measurement or diastolic stress testing are useful. If ischemia is the underlying mechanism of HFpEF, the patient must have coronary angiography, and any lesion treated. If delaying surgery for long is not an option, a bare metal stent is preferred, and double antiplatelet therapy indicated for 4-6 weeks. With a Drug Eluted Stent (DES), antiplatelet treatment is kept for 3-12 months, but non-cardiac surgery should be delayed for a year after DES implantation [27,29]. The ACC/AHA guideline recommends postponing any non-emergent surgery for at least three months after a medicated stent implant due to the risk of stent thrombosis . CVP: Central Venous Pressure; CAD: Coronary Artery Disease; LVH: Left Ventricular Hypertrophy; AF: Atrial Fibrillation; ECG: Electrocardiography; LAE: Left Atrial Enlargement; BNP: Brain Natriuretic Peptide. Table 1: Risk Factors for Diastolic Heart Failure in Preoperative Anesthetic Evaluation. When echocardiography is performed with the patient under general anesthesia, filling parameters should favor the lateral mitral annular tissue Doppler velocity because is the most loadindependent measure in the diastolic evaluation, and is the least affected parameter with changes in preload . Statins should be continued in patients already on them [26,29]. Because the renin-angiotensin-aldosterone system plays a vital role in the development of DHF and myocardial remodeling and fluid retention, angiotensin-converting enzyme inhibitors, angiotensin receptor antagonists, and aldosterone antagonists have been proposed for treatment and may be used perioperatively [26,27,29]. Angiotensin Enzyme Inhibitors (ACEIs) or Angiotensin Receptors Blockers (ARBs) should be considered at least one week before surgery in cardiac stables patients with HF and LV systolic dysfunction , but there is no clear indication for using them in patients with preserved ejection fraction. The Effects of Candesartan in Patients with Chronic HF and Preserved Left-Ventricular Ejection Fraction (CHARM-Preserved) trial did not show a survival benefit of candesartan as an ARB in patients older than 18 years after a median follow-up of 36.3 months . Likewise, the Irbesartan in Patients with Heart Failure and Preserved Ejection Fraction (I-PRESERVE) trial did not show fewer outcomes in those patients receiving the active drug . Drugs to treat pre-existing heart failure, arrhythmias, hypertension, and ischemic heart diseases (e.g., diuretics, β-blockers, calcium channel blockers, antiplatelet agents) should continue during the perioperative period . Two meta-analyses have shown β-blockers to decrease all-cause mortality with no difference in HF hospitalizations [32,33]. β -blockers should continue throughout the perioperative period in patients who were already taking them before surgery for other indications such as angina, hypertension, and symptomatic arrhythmias. Preoperative β-blockers are indicated in patients undergoing high-risk vascular surgery or those having high preoperative Cardiac Risk Index Score. In patients with intermediate-to-low cardiac risk, the proven benefit does not suggest universal use . During volatile or intravenous anesthesia, the patient preserves the myocardial performance through maintenance of ventriculoarterial coupling, the abnormal vascular tone from external or native sympathetic-driven activation can lead to elevations in the left ventricular end-diastolic pressure and left atrial pressure . The presence of abnormal diastolic filling patterns may guide perioperative management of the amount of fluid allowed and supports the early use of inotropic drugs for alterations in hemodynamics as opposed to additional fluid administration to avoid pulmonary edema and vascular overload. In the event the patient has elevated diastolic filling pressures, the first-line intervention for hypotension often is inotropic support and not the fluid administration to prevent further increases in left atrial pressure, which may cause pulmonary edema . Throughout anesthesia, monitoring the volume status is important because these patients are susceptible to changes secondary to surgical bleeding and variations in sympathetic tone that may manifest later in the perioperative period. Thus, inserting an arterial line is necessary for invasive arterial monitoring, indirect assessments of preload by stroke volume variance, and frequent blood sampling; the timing of each depends on experience and local practice. In major or vascular surgery, central venous catheterization, pulmonary artery catheterization, and transesophageal echocardiography may contribute to assessing intravascular volume . There is still debate on the choice of regional versus general anesthesia, and there are no definitive recommendations either way. However, epidural anesthesia is preferable to spinal anesthesia because of slower hemodynamic changes from the onset time and the smooth removal of sympathetic tone. Besides, for general anesthesia, IV induction and maintenance with balanced anesthesia of volatile agents and opioids are recommended . Sevoflurane during spontaneous ventilation preserves diastolic relaxation better than propofol, but there are no differences between them regarding diastolic function during positive pressure ventilation through balanced anesthesia . Isoflurane, desflurane, and sevoflurane had no significant effect on diastolic function in healthy volunteers or patients with diastolic disfunction and improved LV relaxation . Barbiturates and ketamine exert similar effects on diastolic function by inhibiting sarcolemmal transport of calcium ions, and ketamine, in addition, can reduce chamber compliance . Etomidate, propofol, morphine, midazolam, and remifentanil do not appear to have any effect on diastolic performance . Intraoperative Blood Pressure (BP) control is essential; systolic BP must be within a 10%-20% of the baseline value and PP should be below the diastolic BP. In the postoperative period, hypoxemia and Atrial Fibrillation (AF) are the most common complications. Volume overload can cause pulmonary edema, AF or both and maintenance of nitroglycerin at a low dose (25 μg/min) may avoid these complications . Almost 50% of patients diagnosed with HF have a low ejection fraction. Common risk factors to develop HF includes coronary artery disease, arterial hypertension, valvular diseases, AF, and idiopathic cardiomyopathies. Other factors associated with HF are cardiotoxic medication, cancer therapy, viral myocarditis, and drug and alcohol abuse . Prognosis for survival in patients undergoing high or intermediate risk noncardiac or cardiac surgery is worse in patients with depressed LVEF , particularly in those with EF<30% . Ventricular dysfunction rises the perioperative mortality risk 3 to 10-fold among patients undergoing coronary revascularization . Most acute perioperative heart failure occurs in patients who have decreased cardiovascular reserve before surgery. In the perioperative period, patients may face numerous triggers of acute heart failure, including hypertension, tachyarrhythmias, anemia, hypercoagulability, inappropriate fluid management, pain, surgical stress, and myocardial ischemia. Cardiac surgery can have additional complications including spasm or occlusion of a coronary graft, prosthetic paravalvular regurgitation, cardiac tamponade, and pneumo or hemothorax . Patient management should be directed to maintain forward flow to reduce coronary ischemia, pulmonary hypertension and acute and chronic end-organ dysfunction due to hypoperfusion and to promote inotropy without inducing or worsening ischemia . The ESC guidelines recommend therapeutic optimization using β-blockade, ACE/ARB inhibition, and diuretics (Class A). For patients newly diagnosed with CHF, it is recommended to postpone surgery for three months to allow adequate titration of medication for treatment . Baseline medication must continue throughout the whole perioperative period in stable CHF. In individual cases, ACE/ARB inhibitors can be discontinued at the morning of surgery to avoid severe arterial hypotension after induction of anesthesia . With emergency surgery and evidence of preoperative acute HF and congestion the surgical procedure should be postponed, if possible until cardiac recompensation and euvolemia are achieved . Clinical and physical findings are the basis for the diagnosis of acute perioperative HF. Orthopnea, abdominal discomfort, nausea, and vomiting in a patient with a prior diagnosis of HF should prompt the search of additional signs of acute decompensation such as hypotension, tachycardia, hepatic congestion, oliguria, cyanosis, mottling, and disorder consciousness. The association of low cardiac output and tissue hypoxia in the absence of hypovolemia define cardiogenic shock . Additional tests such as ECG, chest radiograph, echocardiogram, and biomarkers are appropriate in this setting. Current evidence does not support the routine use of a pulmonary artery catheter, and the Canadian guidelines on Perioperative Cardiac Risk Assessment recommend against its application in non-cardiac surgery . Induction of general anesthesia leads to vasodilation, loss of sympathetic tone and a shift of volume from the intrathoracic to the extrathoracic compartment. Induction reduces systemic arterial pressure by 20%-30%, intubation increases blood pressure by 20-30 mmHg, and drugs such as nitrous oxide can reduce cardiac output by up to 15% . Mechanical ventilation influences the normal heart-lung interaction. Blood pressure is often decreased after induction and during maintenance of anesthesia. When comparing induction agents, propofol has the most pronounced effects on systemic vascular resistance. Recent studies have shown that Cardiac Output (CO) is not different when comparing etomidate, propofol or midazolam as induction agent . Spinal or epidural (known as neuraxial) anesthesia also induces sympathetic blockade. When reaching the thoracic dermatome level 4, a reduction in the cardiac sympathetic drive may occur, with a subsequent decrease in myocardial contractility, heart rate, and change in cardiac loading conditions . There are no large Randomized Clinical Trials (RCT) assessing the benefit of volatile agents over IV anesthesia in heart failure patients. Even though there is conflicting evidence, the guidelines favor the use of inhaled anesthesia in patients with cardiac disease undergoing cardiac surgery but mention no specific recommendation on patients with HF. A meta-analysis showed a 50% decrease in mortality after cardiac surgery (2.6% vs. 1.3%) odds ratio (OR) = 0.51, 95% confidence interval (CI) 0.33- 0.81, p=0.004, the number needed to treat, 74, in patients who received sevoflurane or desflurane compared with those who received IV anesthesia but does not mention how many patients had HF . Preconditioning and postconditioning mechanisms that attenuate apoptosis and necrosis and reduce myocardial dysfunction after ischemia and reperfusion may be responsible for this effect . A multicenter randomized trial by Landoni et al. compared sevoflurane at 0.5-2 Minimum Alveolar Concentration (MAC), equal to 1-4 vol%, 4-6 h (from induction of anesthesia to transport to the Intensive Care Unit (ICU) and including cardiopulmonary bypass) with propofol at an infusion rate of 2-3 mg/kg/h for the same period of 4-6 h, in 200 patients undergoing high-risk cardiac surgery. The mean surgery time was 288 min in the propofol group and 295 min in the sevoflurane group. There was no beneficial effect of sevoflurane on the composite endpoint of prolonged ICU stay, mortality, or both. These results are difficult to extrapolate to patients with HF since only 18% of those in the propofol group, and 12% in the sevoflurane group had this condition . In a small randomized trial in patients undergoing minimally invasive mitral repair, Moscarelli et al. compared sevoflurane at a minimum dose of 1 MAC (average 1.2 ± 0.2) with propofol at a starting dose of 2 mg/kg and maintained at 0.1-0.5 mg/kg/ min during the procedure. The mean operation time was 320 ± 50.6 min in the propofol group and 322 ± 41 min (p=0.88) in the sevoflurane group. The authors used the values of cardiac troponin I (cTnI) at 6 hours after surgery as a measure of cardiac protection and found a nonsignificant 8% lesser increase of cTnI in the propofol group compared to the sevoflurane group . In this study, only 3/31 patients (9.6%) in the propofol group and 4/31 (12.9%) in the sevoflurane group had an EF<50%. A study conducted in patients with Coronary Artery Disease (CAD) undergoing vascular surgery compared the cardioprotective effects of sevoflurane with those of propofol. Patients randomized to the sevoflurane arm maintained a MAC of 1-1.5 and those in the propofol group had an induction dose of 1-2 mg/kg and a maintenance dose 2-3 mg/kg/h. The mean EF was 45 ± 3.8% and 45 ± 3.9% respectively (p>0.05). The cTnI levels at six hours postoperatively were significantly lower in the sevoflurane group than in the propofol group . A meta-analysis by Zorrilla-Vaca et al. demonstrated that different volatile drugs had similar protective benefits in postoperative outcomes of cardiac surgery . More recently, an RCT compared isoflurane (titrated to maintain an end-tidal concentration between 0.8 and 1.2) with propofol (10 mg/kg/h for the first 10 min, then 8 mg/kg/min for the next 10 min and 6 mg/kg/min thereafter) in coronary artery bypass surgery and found similar outcomes in both groups . The EF was 58.3 ± 6.03% and 54.8 ± 3.9% respectively. It seems that IV and inhalation anesthesia are equally effective and safe in patients with preserved or mid-range EF while volatile agents offer more protection in HFrEF. Large RCTs in patients within the whole spectrum of HF are necessary to establish who can benefit from either agent group. Intra-aortic Balloon Pump (IABP) has shown utility in right or left ventricle failure by augmenting cardiac function, increasing coronary perfusion and decreasing myocardial oxygen demand, thus providing temporary support for reversible myocardial failure. Contraindications to the use of IABP include aortic insufficiency, dissection or an aneurysm, severe peripheral vascular disease, or severe blood dyscrasias . However, a recent randomized trial using IABP in high-risk patients (European System for Cardiac Operative Risk Evaluation (EuroSCORE) >6 or LVEF <40%) undergoing coronary artery bypass graft (CABG) surgery, showed no benefits of IABP compared with usual care for a composite outcome of 30-day mortality and major complications [47.8% vs. 46.2%, (absolute risk difference, 1.6%; 95% CI, –12.7% to 15.8%; p = 0.46) p=0.46] . An accompanying metanalysis reported in the former trial confirmed the lack of survival improvement in these patients with the use of IABP. In hemodynamically stable patients with LVEF <35% subject to nonemergent coronary operations, the use of IABP did not result in a lesser mortality rate . In patients with resynchronization devices, it is recommended to keep the device on to provide better hemodynamic stability. Postoperative interrogation of the resynchronization system is mandatory to rule out damage to the equipment and leads and to establish new settings to fit hemodynamic needs or to adjust for higher output requirements by the myocardium . An Implantable Cardioverter Defibrillator (ICC) can misinterpret electromagnetic interference from the electrocautery as arrhythmia and deliver an inappropriate shock to the patient. ICDs can be programmed, or magnets can inhibit ICD arrhythmia detection and tachyarrhythmia functions. The Heart Rhythm Society (HRS) and American Society of Anesthesiologists (ASA) recommend the inactivation of ICDs for all procedures above the umbilicus involving electrocautery or radiofrequency ablation [47,48]. Intraoperative and postoperative transesophageal and transthoracic echocardiography should be performed as early as possible to get data on regional or global, right and or left ventricular dysfunction, cardiac tamponade, cardiac thrombi, valvular dysfunction and preload estimation . The anesthesiology team should monitor intraoperative fluids. Due to low ejection fraction, LV enlargement, and elevated filling pressures, potential fluid overload may lead to heart failure or pulmonary edema. Volume management using dynamic preload indicators like Pulse Pressure Ventilation (PPV) and Stroke Volume Variation (SVV) are often recommended, and these parameters showed superior results when compared with classical preload indicators like Central Venous Pressure (CVP) or Pulmonary Capillary Wedge Pressure (PCWP). However, a PCWP of 12-15 mmHg or a CVP of 8-12 mmHg is recommended in cardiac surgery patients to aid in intraoperative fluid management . There is no evidencebased data to support the routine use of PCWP monitoring; one possible exception is the patient with severe pulmonary hypertension and at risk of for acute exacerbation of Right Ventricle (RV) dysfunction . Maintaining an adequate CO may require the use of inotropes. However, a meta-analysis showed that dobutamine was not associated with improved mortality in patients with acute heart failure compared with controls, OR 1.47 (95% CI=0.98- 2.21, p=0.06) . In another meta-analysis levosimendan, a calcium sensitizer that enhances myocardial contractility without increasing myocardial oxygen use revealed a reduction in overall mortality rate compared with a control group of 17.4% vs. 23.3% (risk ratio 0.80 (0.72-0.89), p<0.001) in cardiac surgery and cardiology settings . Mechanical ventilation may reduce venous return and CO. A large Tidal Volume (TV) can reduce cardiac filling; therefore a TV of 6-8 mL/kg can be used . Left- and right-sided heart failure are separated syndromes; however, patients often present with a combination of both, what is called global congestive heart failure . Optimization of RV filling pressure and function are primary goals in the perioperative management of RVHF. Diuretics are the mainstay of treatment in chronic RVHF. The dose of diuretic therapy varies according to pathogenesis, severity, and coexisting renal disease. In RVHF patients can have normal or low LV filling pressures so close monitoring is necessary to prevent pre-renal azotemia or worse renal function. The goals of volume management in the chronic setting of RVHF are to maintain an adequate preload to keep proper cardiac filling while providing relief from RV volume overload, ventricular interdependence, and congestion . Even though there are no clear guidelines to manage RVHF in contrast to HFrEF, there is evidence derived from small-scale studies to support the use of β-blockers and ACEI/ARBs and hydralazine . Vasodilators, like hydralazine, are associated with severe adverse events. At present, the use of angiotensin-converting enzyme inhibitors, angiotensin-2 receptor blockers, and β-blockers is not recommended in patients with pulmonary hypertension (PH) regardless of RVHF unless associated with coexisting hypertension, coronary artery disease, or LVHF . Digoxin and pulmonary vasodilators are useful sometimes. Sinus rhythm is the best option because atrial fibrillation and heart blocks are not well tolerated . In acute decompensated RVHF the goals are to optimize rate and rhythm, reach optimum RV filling and maintain adequate right ventricle perfusion . Hemodynamic monitoring with a central venous catheter or Pulmonary Artery (PA) catheter can be informative if the volume status is uncertain or if a patient has hemodynamic instability or worsening renal function in response to therapy. The belief that the failing RV should be volume-loaded is not accurate. Overfilling stretches the TV annulus, increases TR, aggravates organ congestion, and decreases TSG and CO. If the CVP exceeds 8 to 12 mm Hg, the patient benefits from decongestion to restore more favorable intraventricular loading conditions and normalized interventricular interaction [12,14]. Nitroglycerin and sodium nitroprusside have short half-lives and are useful to reduce afterload increasing RV and LV systolic volume and facilitating decongestion of the pulmonary and systemic circulations . Inotropes may be needed to augment contractility and increase forward flow, but clinical guidelines recommend against its routine use in hospitalized patients with acute HF . The inotropic choice is a β-agonist (e.g., dobutamine) or a phosphodiesterase-3 inhibitor (e.g., milrinone). However, their increased contractility may offset their effect on reducing Systemic Vascular Resistance (SVR), especially milrinone. Dobutamine, starting at 2.5-5.0 mcg/kg/min, causes much less vasodilation. In severe RV shock, combination inotropy, with low dose milrinone (0.2 mcg/kg/min) and low dose dobutamine (2.5 mcg/kg/min), may be the best choice for increasing contractility with fewer side effects than any drug alone . Perfusion can improve by using inotropes. The inotropic properties and dosedependent vasopressor effect from the α1-agonists, dopamine, norepinephrine, and epinephrine are useful adjuncts to augment contractility in the setting of significant hypotension (systolic BP <80–90 mm Hg) . During non-cardiac surgery, perioperative RV failure is most often, although not only, secondary to acute pulmonary hypertension (increased afterload). In cardiac surgery, volume overload, myocardial ischemia, preexisting RV dysfunction, or arrhythmias. In patients who develop Pulmonary Hypertension (PH) there are no evidence-based data on which anesthesia (regional, general or combined) is best. However, the current PH guidelines recommend epidural rather than general anesthesia in elective surgical procedures (Class IIa, level of evidence C), as controlled mechanical ventilation contributes to an increase in RV afterload . If general anesthesia is mandatory, most authors recommend a balanced technique with higher opioid doses and low-dose volatile anesthetics . When using neuroaxial methods, sympathicolysis can reduce systemic resistance with hypotension. Monitoring and slow titration are recommended. 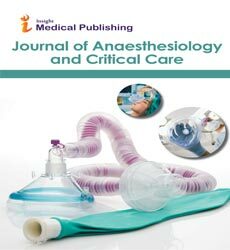 Intravenous and inhaled vasodilators are suitable for lowering intraoperative increasing pulmonary arterial pressure . Specialized multidisciplinary teams should manage patients at risk of an acute postoperative RV failure such as those with previous pulmonary hypertension, RV dysfunction, severe left ventricular dysfunction, and those with planned long cardiopulmonary bypass periods to optimize the continued medical and surgical care . HF has increased perioperative morbidity and mortality. Using echocardiography and natriuretic peptides allow the classification of left and right ventricle heart failure. The adequate use of inotropes and IV fluids avoids the development of pulmonary edema and fluid overload. Volatile anesthetic agents offer better cardio-protection than intravenous agents, and epidural anesthesia is preferable to spinal anesthesia. A specialized multidisciplinary team should manage patients at risk of acute postoperative RV failure, severe left ventricular dysfunction or planned long cardiopulmonary bypass pump time. Ponikowski P, Anker SD, AlHabib KF, Cowie MR, Force TL, et al. (2014) Heart failure: preventing disease and death worldwide. ESC Hear Fail 1: 4-25. Savarese G, Lund L (2017) Global public health burden of heart failure gianluigi. Card Fail Rev 3: 7-11. Chen W, Gao R, Liu L, Zhu M, Wang W, et al. (2016) Outline of the report on cardiovascular diseases in China, 2014. Eur Hear Journal 18: F2-F11. Ciapponi A, Alcaraz A, Calderón M, Matta MG, Chaparro M, et al. (2016) Burden of Heart Failure in Latin America: A Systematic Review and Meta-analysis. Rev Española Cardiol 69: 1051-1060. Mozaffarian D, Benjamin EJ, Go AS, Arnett DK, Blaha MJ, et al. (2016) Heart disease and stroke statistics-2016 update. Circulation 133: 1-324. Weiser TG, Regenbogen SE, Thompson KD, Haynes AB, Lipsitz SR, et al. (2008) An estimation of the global volume of surgery: A modelling strategy based on available data. Lancet 372: 139-44. Fayad A, Ansari MT, Yang H, Ruddy T, Wells GA (2016) Perioperative diastolic dysfunction in patients undergoing noncardiac surgery is an independent risk factor for cardiovascular events. Anesthesiology 125: 72-91. Soussi S, Chatti K, Mebazaa A (2014) Management of perioperative heart failure. Curr Opin Anaesthesiol 27:140-5. Van Diepen S, Bakal JA, McAlister FA, Ezekowitz JA (2011) Mortality and readmission of patients with heart failure, atrial fibrillation, or coronary artery disease undergoing noncardiac surgery: An analysis of 38 047 patients. Circulation 124: 289-96. Ponikowski P, Voors AA, Anker SD, Bueno H, Cleland JGF, et al. (2016) 2016 ESC Guidelines for the diagnosis and treatment of acute and chronic heart failure. Eur Heart J 37: 2129-200. Yancy CW, Jessup M, Bozkurt B, Butler J, Casey DE, et al. (2013) 2013 ACCF/AHA guideline for the management of heart failure. J Am Coll Cardiol 62: e147-239. Konstam MA, Kiernan MS, Bernstein D, Bozkurt B, Jacob M, et al. (2018) Evaluation and management of right-sided heart failure: A scientific statement from the american heart association. Circulation 137: CIR.0000000000000560. Olsson K, Halank M, Egenlauf B, Fistera D, Gall H, et al. (2016) Dekompensierte Rechtsherzinsuffizienz, Intensiv- und Perioperativ-Management bei Patienten mit pulmonaler Hypertonie: Empfehlungen der Kölner Konsensus Konferenz 2016. DMW - Dtsch Medizinische Wochenschrift 141: S42-7. Hrymak C, Strumpher J, Jacobsohn E (2017) Acute right ventricle failure in the intensive care unit: Assessment and management. Can J Cardiol 33: 61-71. Paulus WJ, Tschöpe C, Sanderson JE, Rusconi C, Flachskampf FA, et al. (2007) How to diagnose diastolic heart failure: A consensus statement on the diagnosis of heart failure with normal left ventricular ejection fraction by the heart failure and echocardiography associations of the european society of cardiology. Eur Heart J 28: 2539-50. Nagueh SF, Smiseth OA, Appleton CP, Byrd BF, Dokainish H, et al. (2016) Recommendations for the evaluation of left ventricular diastolic function by echocardiography: An update from the american society of echocardiography and the european association of cardiovascular imaging. J Am Soc Echocardiogr 29: 277-314. Shillcutt SK, Chacon MM, Brakke TR, Roberts EK, Schulte TE, et al. (2017) Heart failure with preserved ejection fraction: A perioperative review. J Cardiothorac Vasc Anesth 31: 1820-30. Tanai E, Frantz S (2016) Pathophysiology of heart failure. Compr Physiol 6: 187-214. Healy KO, Waksmonski CA, Altman RK, Stetson PD, Reyentovich A, et al. (2010) Perioperative outcome and long-term mortality for heart failure patients undergoing intermediate- and high-risk noncardiac surgery: Impact of left ventricular ejection fraction. Congest Hear Fail 16: 45-49. Smit-Fun V, Buhre WF (2016) The patient with chronic heart failure undergoing surgery. Curr Opin Anaesthesiol 29: 391-6. Lee TH, Marcantonio ER, Mangione CM, Thomas EJ, Polanczyk A, et al. (1999) Prediction of cardiac risk of major noncardiac surgery. October pp: 1043-9. Flu WJ, van Kuijk JP, Hoeks SE, Kuiper R, Schouten O, et al. (2010) Prognostic implications of asymptomatic left ventricular dysfunction in patients undergoing vascular surgery. Anesthesiology 112: 1316-24. Cohn SL (2016) Preoperative evaluation for noncardiac surgery. Ann Intern Med 165: ITC81. Fleisher LA (2016) Preoperative assessment of the patient with cardiac disease undergoing noncardiac surgery. Anesthesiol Clin 34: 59-70. Alvarez EJ, Calvo VJM, Veiras S, García R, González A, et al. (2015) Clinical Practice Guideline (CPG). Recommendations on strategy for reducing risk of heart failure patients requiring noncardiac surgery: Reducing risk of heart failure patients in noncardiac surgery. Rev Esp Anestesiol Reanim 62: 359-419. Kristensen SD, Knuuti J, Saraste A, Anker S, Bøtker HE, et al. (2014) 2014 ESC/ESA guidelines on non-cardiac surgery: Cardiovascular assessment and management: The joint task force on non-cardiac surgery: Cardiovascular assessment and management of the european society of cardiology (ESC) and the european society of anaesth. Eur Heart J 35: 2383-431. Ryu T, Song SY (2017) Perioperative management of left ventricular diastolic dysfunction and heart failure: An anesthesiologist’s perspective. Korean J Anesthesiol 70: 3-12. Nguyen LS, Baudinaud P, Brusset A, Nicot F, Pechmajou L, et al. (2018) Heart failure with preserved ejection fraction as an independent risk factor of mortality after cardiothoracic surgery. J Thorac Cardiovasc Surg 156: 188-93. Fleisher LA, Fleischmann KE, Auerbach AD, Barnason SA, Beckman JA, et al. (2014) 2014 ACC/AHA guideline on perioperative cardiovascular evaluation and management of patients undergoing noncardiac surgery: A report of the american college of cardiology/american heart association task force on practice guidelines. J Am Coll Cardiol 64: e77-137. Yusuf S, Pfeffer MA, Swedberg K, Granger CB, Held P, et al. (2003) Effects of candesartan in patients with chronic heart failure and preserved left-ventricular ejection fraction : the CHARM- Preserved Trial. 362: 777-81. Komajda M, Mckelvie R, Zile MR, Anderson S, Donovan M, et al. (2008) Irbesartan in patients with heart failure and preserved ejection fraction. N Engl J Med 359: 2456-67. Bavishi C, Chatterjee S (2015) Beta-blockers in heart failure with preserved ejection fraction : A meta-analysis. Heart Fail Rev 20: 193-201. Liu F, Chen Y, Feng X, Teng Z, Yuan Y, et al. (2014) Effects of beta-blockers on heart failure with preserved ejection fraction: A meta-analysis. PLoS One 9: e90555. Karam D, Arora R (2017) Perioperative β-blockers in patients undergoing noncardiac surgery-scientific misconduct and clinical guidelines. Am J Ther 24: e435-41. Rupert E, Sarkar S, Guha BR (2010) Echocardiographic evaluation and comparison of the effects of isoflurane, sevoflurane and desflurane on left ventricular relaxation indices in patients with diastolic dysfunction. Ann Card Anaesth 13: 130. Singh A, Mehta Y (2018) Heart failure with preserved ejection fraction (HFpEF): Implications for the anesthesiologists. J Anaesthesiol Clin Pharmacol 34: 161-5. Chua JH, Nguyen R (2015) Anesthetic management of the patient with low ejection fraction. Am J Ther 22: 73-9. Duceppe E, Parlow J, MacDonald P, Lyons K, McMullen M, et al. (2017) Canadian cardiovascular society guidelines on perioperative cardiac risk assessment and management for patients who undergo noncardiac surgery. Can J Cardiol 33: 17-32. Landoni G, Greco T, Biondi-Zoccai G, Neto CN, Febres D, et al. (2013) Anaesthetic drugs and survival: A bayesian network meta-analysis of randomized trials in cardiac surgery. Br J Anaesth 111: 886-96. Landoni G, Guarracino F, Cariello C, Franco A, Baldassarri R, et al. (2014) Volatile compared with total intravenous anaesthesia in patients undergoing high-risk cardiac surgery: A randomized multicentre study. Br J Anaesth 113: 955-63. Moscarelli M, Terrasini N, Nunziata A, Punjabi P, Angelini G, et al. (2018) A trial of two anesthetic regimes for minimally invasive mitral valve repair. J Cardiothorac Vasc Anesth 32: 2562-9. Amr Y, Bassuoni A (2012) Cardioprotective effect of sevoflurane in patients with coronary artery disease undergoing vascular surgery. Saudi J Anaesth 6: 125. Zorrilla-Vaca A, Núñez-Patiño RA, Torres V, Salazar-Gomez Y (2017) The impact of volatile anesthetic choice on postoperative outcomes of cardiac surgery: A meta-analysis. Biomed Res Int pp: 7073401. Kuppuswamy B, Davis K, Sahajanandan R, Ponniah M (2018) A randomized controlled trial comparing the myocardial protective effects of isoflurane with propofol in patients undergoing elective coronary artery bypass surgery on cardiopulmonary bypass, assessed by changes in N-terminal brain natriuretic peptide. Ann Card Anaesth 21: 34-40. Rocha Ferreira GS, de Almeida JP, Landoni G, Vincent JL, Fominskiy E, et al. (2018) Effect of a perioperative intra-aortic balloon pump in high-risk cardiac surgery patients. Crit Care Med 46: e742-50. Ranucci M, Castelvecchio S, Biondi A, De Vincentiis C, Ballotta A, et al. (2013) A Randomized controlled trial of preoperative intra-aortic balloon pump in coronary patients with poor left ventricular function undergoing coronary artery bypass surgery. Crit Care Med 41: 2476-83. Roberts JD, Sweitzer B (2014) Perioperative evaluation and management of cardiac disease in the ambulatory surgery setting. Anesthesiol Clin 32: 309-20. Crossley GH, Poole JE, Rozner MA, Asirvatham SJ, Cheng A, et al. (2011) The heart rhythm society (hrs)/american society of anesthesiologists (asa) expert consensus statement on the perioperative management of patients with implantable defibrillators, pacemakers and arrhythmia monitors: Facilities and patient management. Hear Rhythm 8: 1114-54. Chen CQ, Wang X, Zhang J, Zhu SM (2017) Anesthetic management of patients with dilated cardiomyopathy for noncardiac surgery. Eur Rev Med Pharmacol Sci 21: 627-34. Tacon CL, McCaffrey J, Delaney A (2012) Dobutamine for patients with severe heart failure: a systematic review and meta-analysis of randomised controlled trials. Intensive Care Med 38: 359-67. Landoni G, Biondi-Zoccai G, Greco M, Greco T, Bignami E, et al. (2012) Effects of levosimendan on mortality and hospitalization. A meta-analysis of randomized controlled studies. Crit Care Med 40: 634-46. Galiè N, Humbert M, Vachiery JL, Gibbs S, Lang I, et al. (2016) 2015 ESC/ERS Guidelines for the diagnosis and treatment of pulmonary hypertension. Eur Heart J 37: 67-119. Harjola V, Mebazaa A, Čelutkienė J, Bettex D, Bueno H, et al. (2016) Contemporary management of acute right ventricular failure: A statement from the heart failure association and the working group on pulmonary circulation and right ventricular function of the european society of cardiology. Eur J Heart Fail 18: 226-41.